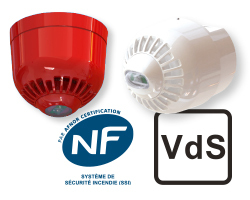 Sonos Pulse visual alarm devices have recently achieved NF and VdS certification to EN54-23, adding to existing LPCB certificates. At Klaxon Signals we view regulatory compliance as a minimum requirement for our products. We design Klaxon products to exceed international standards and are proud to announce that Sonos Pulse has been certified by such renowned quality marks. Sonos Pulse devices contain Pulse Alert Technology, Klaxon’s EN54-23 compliant visual notification for wall and ceiling mount devices. Pulse Alert Technology provides visual notifications that are unmissable and unmistakable, ensuring that everyone is notified of a fire evacuation emergency.